Is this blog a Staind song? Because it’s been awhile. Ever since my last post about the Hawkeyes vs. Gophers game I’ve been pretty busy with work, Thanksgiving, and more work. Even though Thanksgiving has passed, I am thankful for the progress I’ve seen this year with my photography. I signed a contract to start freelancing for Getty Images and USA Today Sports Images, which I’m ecstatic about! So why this game to write about? For one, it’s the Maple Leafs. They have Auston Matthews, the #1 overall pick in the 2016 NHL draft; he’s sensational on the ice. Mitch Marner, who I personally think is going to be the guy Toronto depends on outside of Matthews/Tavares, has 6 goals, 32 assists in 27 games played. There’s John Tavares, the big free agent signing Toronto was able to get over the Summer after his contract with the New York Islanders was up. And finally, although he didn’t play, William Nylander signed his contract with about 8 mins to go to the Dec. 1st 5 PM EST deadline. 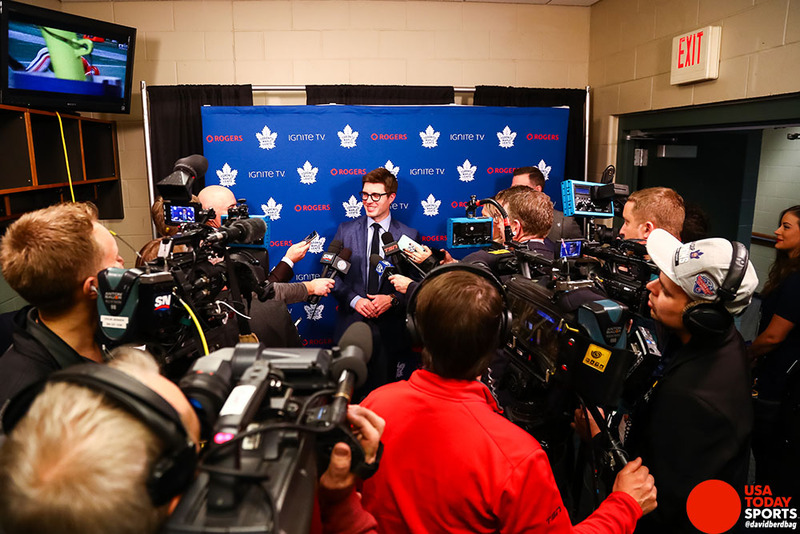 I honestly went into the game thinking Nylander was going to hold out and in turn, wasn’t going to play for the rest of the season, but they were able to get a deal done and I was able to get some photos of Leafs’ GM Kyle Dubas after the news broke, which was a bonus to this assignment. This was also my first assignment for USA Today, which is the 2nd reason why I wanted to write about this game. Normally don’t do pressers, but given the Nylander news I decided to join in. This game was interesting in that the Wild, who are currently on a skid, didn’t play bad at all but still ended up losing 5-3. Two goals against the Wild took weird bounces off of their defenseman Nick Seeler, but for close to two periods the Wild were able to sustain constant pressure on the Leafs after they opened up the scoring in the 1st period on an Auston Matthews powerplay goal. I was a little surprised when I saw that including me, there were only 3 photographers (AP and team) covering the game that night, so after getting assigned a spot between the benches for the third period I was able to pick where I wanted to shoot for the first and second. I picked the end closest to the media workroom and I missed Matthews scoring his goal and then the second period the Wild started to put the pressure on and scored two goals. I was kicking myself because I was missing every goal until Zach Hyman deflected one in and scored. Whew. Between the bench stuff can be pretty hit or miss, I usually use that time to get some photos of players and coaches on the bench. I tried to get a little creative with my shots, still not sure how I feel about them yet. Next two photos are what I usually do for my bench shots. As the game ended and I was trying to get photos of the Leafs players celebrating, smiling, etc I saw Mitch Marner stop for a picture with a young fan that was right at the tunnel the players enter and exit. He took a pic, then grabbed a sharpie and gifted him a signed stick. Glad I stuck around and was able to capture that. Last post of mine until my end of the year post, thanks for reading!